Pantelligent/KickstarterThe future of the frying pan is here: a Bluetooth-enabled pan that helps you cook. Never feel the need to order takeout after a poorly cooked meal again. A new Kickstarter project is promoting something called Pantelligent, which is exactly like a frying pan — only smarter. Fed up with the fact that “frying pans have barely changed in thousands of years,” four MIT engineers created this high-tech frying pan. It has a temperature sensor on the inside that communicates with a smartphone app to give the chef a step-by-step guide to cooking a perfect meal. The app comes pre-loaded with a bunch of recipes, including ones for buttermilk pancakes, mushroom risotto, seared scallops, salmon, scallion pancakes, and more. Electronics in the handle transmit the data to a phone through Bluetooth. Just tap the phone to the pan’s handle to get the data, and the app can say how hot the pan is, when to add ingredients, and when to stir or flip. All the cook needs to do is follow the alerts. 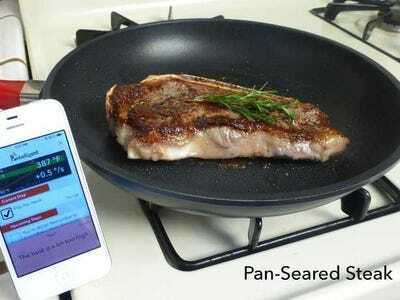 The pan is able to do this through a “patent-pending design that accurately measures the temperature of the pan’s cooking surface,” according to the Kickstarter page. It even gives reassurances and says things like “spot on” when the chef has done done a step correctly. Chefs who don’t want to follow a step-by-step process can use the “freestyle” mode, which allows the user to set a target temperature for the pan and warns if the pan gets too hot or cold. The freestyle mode works like a “sous chef that never gets distracted,” according to Kickstarter. It even has a recipe-recording feature, which allows chefs to record someone cooking so that they can emulate them later. This feature would be perfect for someone trying to get a family recipe just right. The smart-pan has recieved a lot of praise on Kickstarter, and has already raised $US8,000 more than its $US30,000 goal at the time of this post, with 42 days lefts to go. Pantelligent asks for a $US199 pledge, and will be delivered in August of 2015. But for those who want it immediately, the creators are offering a prototype to be delivered in January for a pledge of over $US2,000. For more information, check out the Kickstarter page here.